Earlier this month casting director David Rapaport — who casts The Flash, Arrow, Supergirl, and other CW shows — gave his Twitter followers a glimpse at just how difficult his job can be — and he also gave actors a look at what odds they’re facing when they go in for an audition. 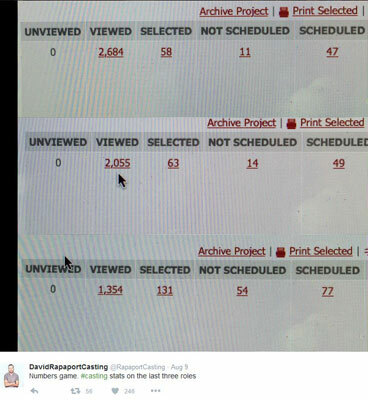 For three roles, Rapaport and his team viewed 2684, 2055, and 1354 potential actors. Most didn’t make the cut. For the role with 2684 candidates, only 58 were selected for callbacks — that’s just a hair over 2%. While the odds were a little better for the role that had 1354 candidates (131 were selected), that still amounts to just a 10% selection rate. Of course, ultimately three of those approximately 6093 auditioning actors will end up with roles. Now, if you’re an actor the takeaway here isn’t to despair at your odds. On the other hand, it’s a good idea to have an idea of exactly what kind of competition you are facing when you are auditioning. Remember, you are one out of potentially thousands of actors vying for what could be a small role on a television series. What are you doing to make sure you set yourself apart from the rest of the pack?